In March 2001, Nova Scotia's provincial government released its energy strategy document entitled "Powering Nova Scotia's Economy". The document is intended to be a "public discussion paper on the province's energy strategy." The document is the product of the province's Petroleum Directorate and the Department of Natural Resources (PDF Copies of "Powering Nova Scotia's Economy" can be obtained from the Nova Scotia government's website: http://www.gov.ns.ca/petro/EnergyStrategy/). The units of energy used in both the energy strategy document and this report are petajoules (abbreviation 'PJ') or 1015 joules. A petajoule is equivalent to about 29 million litres of gasoline; enough energy to drive about 14,000 cars for one year . This section of the document (pages iv through vii) contains a description of what is claimed to be Nova Scotia's present energy consumption patterns, both in terms of primary energy demand and end-use energy demand. It touches briefly on projected energy demand, based upon NRCan data, to 2010. 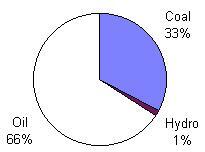 The province consumed some 269.4 PJ of energy from oil (177.1 PJ), coal (88.4 PJ) and hydro-electric/tidal (3.8 PJ). On page iv, the document states that "the absence of any specific information on wood use in the province creates a gap in the Nova Scotia data on energy use." Contrary to what is stated in the energy strategy document, the province does use renewable energy (in the form of wood waste and pulp spenting) to satisfy its primary energy demand. What is even more disturbing is the suggestion that in 1999, oil accounted for 66 percent of the province's primary energy demand, while in 1997 it was only 57 percent. There was not a 9 percent growth in oil consumption in the province between 1997 and 1999 (as shown in ). The energy strategy document combines the provincial renewable energy demand with the oil demand to create the impression that oil satisified a larger share of the province's primary energy demand. NRCan's actual data for end-use energy demand for the province shows industrial and residential energy usage to be considerably higher. The reason for the discrepancy between the data in the energy strategy document and the NRCan data can be explained by the omission of renewable energy. The NRCan end-use data for 1997 is listed in an appendix at the end of this report. The authors of the document were presumably aware of the role of renewables in the province. For example, on page xxvi, the document describes the Brooklyn Energy Centre, a "22 MW co-generation plant fueled by wood waste". In the same paragraph, the document discusses sawmills that use sawdust-fired kilns, biomass heating of greenhouses, manufacturing facilities, hospitals, and schools. It also states that the residential use of wood fuel is expected to rise in 2001 because of increased world oil prices. The total GW.h (gigawatt-hours) of electricity produced in 1997 (not necessarily by NS Power) is listed as 10,300 (chart at bottom of page vi). If these GW.h listed are added together, the total is 10,200. The 1997 GW.h do not take into account electricity generated from renewables (320 GW.h from wind and wood ), nor are the inter-provincial exports (345 GW.h ) and imports (185 GW.h ) listed. This section (pages viii though xiii) examines recent prices for a number of energy commodities, notably petroleum products (gasoline, home heating oil), electricity (residential, time-of-use, industrial, and commercial), and natural gas (based upon Sempra's projections). With the exception of electricity, all data is 'historical' and covers 1999 and 2000 (electrical data is for 1995/96 to 2000). The document does not consider long term energy prices, nor does it discuss disposable income. Although household disposable incomes are projected to rise by 14% (2010) and 17.6% (2020), residential energy prices increase by 27.9% (2010) and 50.8% (2020). 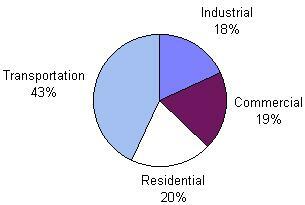 Similarly, the energy costs associated with transportation are projected to rise by 23.8% (2010) and 44.6% (2020). In short, energy prices are expected to rise at much faster rates than disposable income. This section (pages xiv through xvi) discusses Nova Scotia's past ventures in the field of oil and gas and its present and future activities. According to the document, the proven reserves have increased from 3.5 to 6.3 trillion cubic feet, the total potential reserves have been estimated to be 20 trillion cubic feet. The document also states that some investment analysts project potential reserves of anywhere from 40 to 50 trillion cubic feet (based upon deep-water areas beyond Sable Island). The province's total potential reserves of 20 trillion cubic feet seems like a very large number, until it is compared with U.S. energy consumption. In 1999, the U.S. consumed 21.4 trillion cubic feet of natural gas  (Nova Scotia's potential reserves would have come close to supplying U.S. natural gas needs for about one year). It is projected that by 2020, the U.S. will consume as much as 36.1 trillion cubic feet of natural gas  (Nova Scotia's potential natural gas reserves of would supply the U.S. market for about six months to a year). Nova Scotia's proven reserves of 3.5 to 6.3 trillion cubic feet of natural gas are between 6 and 11 percent of Canada's established marketable natural gas . When discussing potential reserves, it is worth noting that these are best-guess projections (some more optimistic than others). For example, the most optimistic prediction of 50 trillion cubic feet of offshore natural gas is still only 8 percent of Canada's ultimate potential resource of 593 trillion cubic feet . technology for the offshore is mature, having been developed for areas such as the Gulf of Mexico and the North Sea. That does not preclude advances in the technology; however, it is more likely to be developed in countries with the expertise. oil and gas technology is far less labour intensive than it has been in previous decades. 'Smart' drilling technology and the growing reliance on computers have significantly reduced the need for 'brute force', meaning that less human-involvement per unit of energy extracted will be required than in the past. countries such as Norway have developed an incredible expertise in this field -- their citizens are found around the world helping develop and manage offshore projects. To suggest or imply that Nova Scotia will emulate Norway is optimistic -- for every Norway, there are countries with oil and gas fields that are not known for exporting their expertise, consider Indonesia, Venezula, Columbia, and Mexico. The energy strategy document is heavily biased towards oil and gas with little interest being shown in renewable energy technology. The data supplied in the document is insufficient for anyone to determine the different fuel types used in each sector of the economy. Provincial energy data has been misrepresented in favour of oil and gas. The potential impact of the rising cost of energy on Nova Scotians has been overlooked. The amount of off-shore natural gas, although significant in terms of frontier regions, is small when compared to Canada's overall natural gas reserves. The potential for employment in the oil and gas sector is optimistic and based upon old ideas. In conclusion, it is the author's belief that the entire provincial energy strategy is flawed. What the province needs is an energy policy to address issues such as transportation, climate change, renewable energy, sustainable energy, conservation, the role of independent power producers, and energy efficient practices. Instead, what is being presented as an energy "strategy" is a plan for promoting the province's limited oil and gas resources. Statistics Canada and Natural Resources Canada, Energy Statistics Handbook, October 1997. Statistics Canada, Quarterly Report on Energy Supply-Demand in Canada 1999 - IV, vol. 24, no. 4, January 2001. Catalog 57-003-XPB. 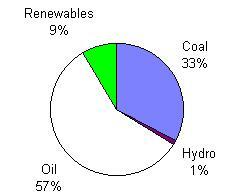 Energy Information Administration, Annual Energy Outlook 2001, 2001. National Energy Board, Annual Report 2000 - Appendices, 2001. National Energy Board, Canadian Energy Supply and Demand to 2025, 1999. 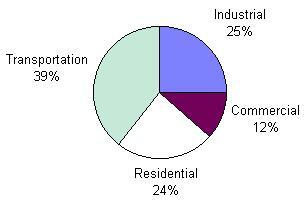 The following NRCan data is for the different sectors of the Nova Scotia economy. The 1997 data is actual, while 2000 is projected; all values are in petajoules (PJ).